With the Material Layer Interface (MLI) you can create Material Layers and passes in 3D Studio Max and it's easy to handle them! With this tool you can rename your selected objects. 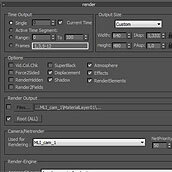 Additional to the rename tool from 3ds Max you can make all the selected objects to instances of the first selected object. So all objects get the same geometry and are an instance.